A few months ago, I shared my Morning Beauty Routine and have gotten a lot of requests for the nighttime routine. Truthfully, it’s not all that different, just a swap in some of the products I use, but there’s also a big emphasis on getting a good night’s sleep and I aim for 7-8 hours. So today I thought I’d share my nighttime skincare routine with you! I love getting up early in the morning and working out, so it’s key that I get a good night’s sleep, which is also important for our health and beauty. I usually head upstairs for the night around 9 p.m. I’ll bring my hot cup of peppermint tea with me and set it on my tea warmer (did you know that peppermint tea promotes sleep?) and turn on my lavender diffuser. The scent is intoxicating and fills the room with a lovely, relaxing lavender scent. I also turn the lights on dim so that it signals it’s time to wind down. Before getting into bed, I spend a few minutes on my nightly skincare routine. If you’ve followed me for the last couple of years, you know I’m fanatical about Colleen Rothschild’s skincare line. I even got my mom hooked on it and Ali-Shaun and have heard choruses of “thank you’s” from many of you after you’ve tried it for yourself. I’m a big advocate of the Colleen Rothschild line because it’s done so much for my sensitive and aging skin. Being in my 40s, I’m no spring chicken, and I’ve seen such a big difference in the texture, brightness, and condition of my skin since using her products. 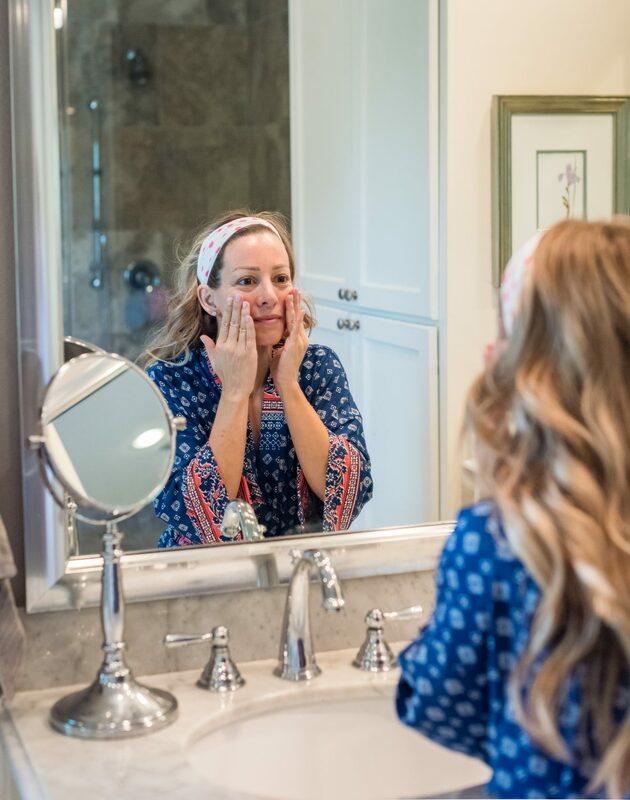 So, let me break down the whole routine for you, and it’s actually pretty simple because, at the end of a long day, I want a skincare routine that only takes a few minutes. Even though it’s a quick routine, if you have time, doing the routine slowly and intentionally is a great way to relax and unwind before bed. I start with using the Cleansing Balm to wash my face. I used to feel like this stuff was so good that I had to “save” it for special occasion cleansing, then I realized I was being silly. 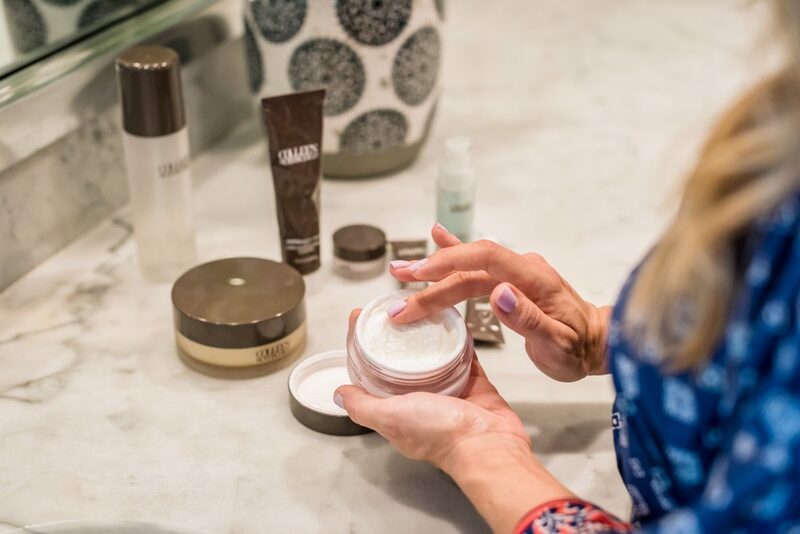 The cleansing balm is so rich and creamy and luxurious, it really feels like a mini spa treatment every night. My skin loves it and it truly leaves my face looking radiant – just like the name says – after I use it. 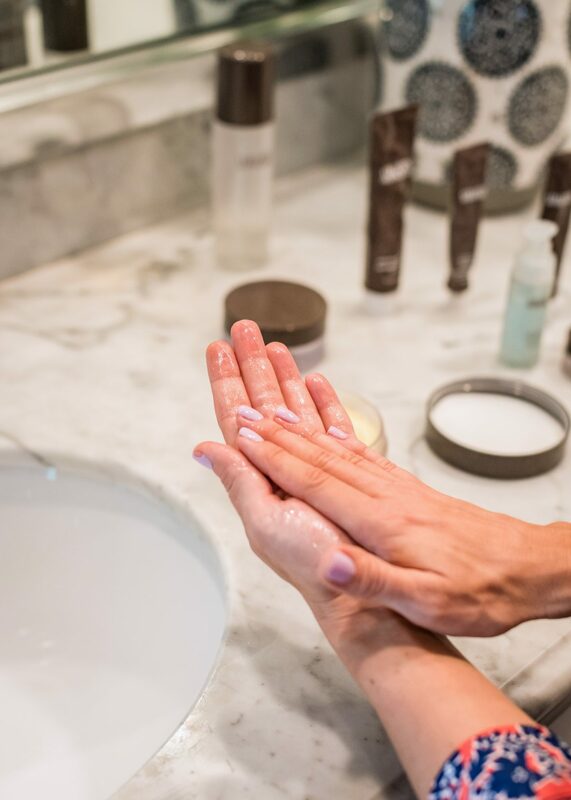 How to Use: Put small amount of the cleansing balm in your dry palms and rub it together to warm it up. (A little goes a long way!) Then, using circular motions, rub it all over your face. The smell is heavenly and it feels so luxurious. Then you get the muslin cloth wet and wipe the product off of your face. That cloth helps gently exfoliate your skin and you can literally feel the difference after. I follow up by splashing my face with cool water. It feels so good! Tip: The cleansing balm comes with a quality muslin cloth and you can order more if you need to. After washing my face, I rinse my cloth clear, wring it out, then hang it on the hand towel rack to dry. Then, I wash the cloth in the washing machine about once a week. If I have particularly stubborn eye makeup on, a tiny dot of the Balancing Gel Cleanser will wash it right off! The delicate area around our eyes gets this Retinol Supreme Eye Serum to help reduce wrinkles, puffiness, and under eye bags. The serum is made with a blend of retinol and vitamin C and a special moisturizer to help revitalize the delicate skin around the eyes. How to Use: Use your ring finger to gently pat around the bone area of the eye from the outside corner inward. Next, because I am getting older and want to reduce those signs of aging on my face: texture, dehydration, elasticity, fine lines, radiance, and tone, I use the Age Renewal Super Serum. The concentrated formula is infused with more than 20 potent ingredients, including peptides, collagen boosters, amino acids, vitamins, and plant extracts. Combined, this serum helps to restore the skin’s complexion to its most youthful radiance and texture. It also helps reduce those photo aging affects. 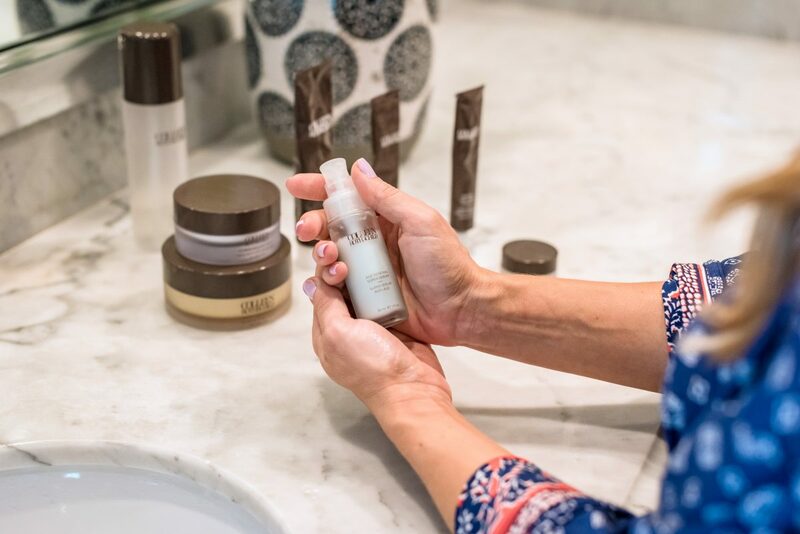 How to Use: After cleansing, gently massage several drops of Age Renewal Super Serum onto face, neck, and décolleté. I still cannot believe how much I love putting oil on my skin and how it doesn’t break me out! I have sensitive, acne-prone skin, and using oil just sounds so counterintuitive to me. You’d think you want to keep oil away from your face, right?! But, honestly, I started with the Face Oil No. 9 (which I’ll talk about below) and since then, haven’t skipped a night without it! My skin always wakes up looking refreshed and restored. This special Retinol Supreme Night Oil combines the regenerative benefits of retinol (which encourages healthy skin renewal) with the moisturizing properties of nine plant-based oils that replenish moisture and help prevent irritation and flaking. The highly potent Vitamin C counteracts the havoc of free radicals and environmental toxins. I use it a couple times a week, then alternate the other nights with the Face Oil No. 9. How to Use: Gently massage 3-4 drops onto your face and neck. Or if you’re like me, you also rub it into your hands! Tip: When using retinol, your skin can become sensitive to UVA and UVB rays, so use a broad spectrum SPF when going into the sun. The Extreme Recovery Cream is creamy and goes on light and will quickly become your favorite daily moisturizer. It immediately soaks into my skin and doesn’t leave it greasy or oily. I also like how there’s no taste to it- I apply it on my lips and hands too! It moisturizes and evens out skin tone and texture, while improving fine lines and wrinkles. How to Use: Gently massage into a cleansed face and neck. If my skin is feeling particularly dry, I make a ‘cocktail’ out of the Extreme Recovery Cream and Face Oil No. 9 by dipping my finger in the cream and then adding a couple drops of the oil and rub them together in my hands before applying to my face. I’ll alternate between this face oil and the Retinol Supreme Night Oil. The Face Oil No. 9. gives a deep moisturize boost to nourish thirsty skin and the active combination of precious oils and vitamins offers protection from oxidative stress that results in the appearance of spots and wrinkles. But the cool thing is, it leaves no greasy residue. I was just in Denver, Colorado and the air is super dry there compared to the humidity we have in Houston. I was sooooo glad I brought both the Extreme Recovery Cream and Face Oil No. 9 because I was slathering them on everyday (morning and night)! They totally saved my skin while I was there. And I use them both in Houston too, just not as much. A little goes a long way! How to Use: If my skin is feeling particularly dry, I make a ‘cocktail’ out of the Extreme Recovery Cream and Face Oil No. 9 by dipping my finger in the cream and then adding a couple drops of the oil and rub them together in my hands before applying to my face. Finally, I swipe a bit of this amazing lash serum to my eyelashes every night and it has truly helped grow back my lashes to lushes fullness! In addition to my nightly beauty routine, about 2-3 times a month I’ll do a mask- my favorite being the Clarifying Detox Mask. I like this mask to get in there and really remove all the trapped dirt and debris that can build up over time. You might look funny while it’s on (like you’re wearing mud on your face! ), but it’s a good way to get a laugh out of the kids. It’s activated charcoal and French Kaolin clay detox your pores and leave behind a balanced complexion. It has a blend of Vitamin C and Willowherb extract to brighten and soothe inflamed skin. It’s good stuff! How to Use: Apply a layer to face and neck, avoiding eye area. Leave on for 10 minutes, allowing mask to dry. Rinse with tepid water then gently pat dry. Use 2-3 times a week or as a spot treatment as needed. Might as well take advantage of those 10 minutes to relax with a good magazine! I subscribe to a lot of magazines on my iPad, but the Magnolia Journal is one I like to read while holding in my hands. Do you get that magazine? It’s my fave! What are your favorite magazines? When you rinse that mask off your skin will feel amazing! You might be like I was originally, and have no idea where to start. But, lucky YOU, Colleen has her personal recommendations online with her recommended routines. That’s a great place to start, but you can also search by your own specific skin concerns (blemishes; fine lines/wrinkles; uneven skin tone; pores; dehydration). Use my personal promo code HWH20 to get 20% off your order! I’d love to hear what skincare products you swear by! Do you have a nighttime skincare routine or stick to one or two things? See you back here tomorrow with the last day of our #HWHFitnessChallenge! Woohoo!!! I hardly call that a “simple” nighttime routine . Your lifestyle is not a reality for many. I don’t understand the point of commenting rude things. She isn’t forcing anything on anyone. Simply explaining what SHE does since people do ask. It’s not fair to be rude because this isn’t something you would choose or see as a reality for yourself. For many of us aging women, we like to life each other up and share what works. I’m so glad you find my posts helpful Tiffany! That’s always the goal! Goodness! It still surprises me how people find it worthwhile to leave negative comments like that. If it’s not you’re thing, move along! I’m just curious.. why would you take the time to read her blog if you either aren’t interested or have something less than polite to say? I have read this blog for years and never have a I felt offended by a single post. And if I was offended or I wasn’t interesting in reading about decorating, organizing, health and fitness, beauty, fashion or motherhood, I would simply unsubscribe from a blog or not read it and move on. Megan, I love your posts and I find them interesting and inspirational. 🙂 keep them coming! So kind Sarah! Thank you so much for being a long-time reader! I appreciate you!! I’ve been using these products because of you 🙂 Love them! Love your bathrobe!! Where’s it from. I love them too! The robe is old from Nordstrom! I just used your promo code to order my first set of Colleen Rothschild skin care products. I am excited to try them…thanks for the interesting blog post about your routine! Thank you for the routine info! I don’t have a lot of time, and this looks like I can squeeze it in! It doesn’t take much time, but the benefits are truly visible! YOU ARE IN YOUR 40s?! Super sweet Gill! Thank you! Wish we could get these products in Europe – I’ve heard great things about the Colleen Rothschild line. Oh that’s a bummer!! I guess I didn’t realize they don’t ship overseas. I need to try this line! I’m feeling like I have aged a ton in the last year 🙁 UGH! I’ve got sensitive, acne prone skin too, so this could be worth trying! Love all the suggestions Megan! My skin was looking bad right after I turned 40 and then when I got pregnant with Jordan and after. I’m so thankful for these products because my skin really looks so much better now! I’ve heard so many people love them too, so I’m happy to share! Great post! Can’t believe how negative people can be…ignore them. Thanks for the idea of the peppermint tea. I will be trying that. While I don’t use the Colleen Rothschild line, I agree a routine really helps your skin look great. I am 63 and use a combination of Philosophy and Olay products. 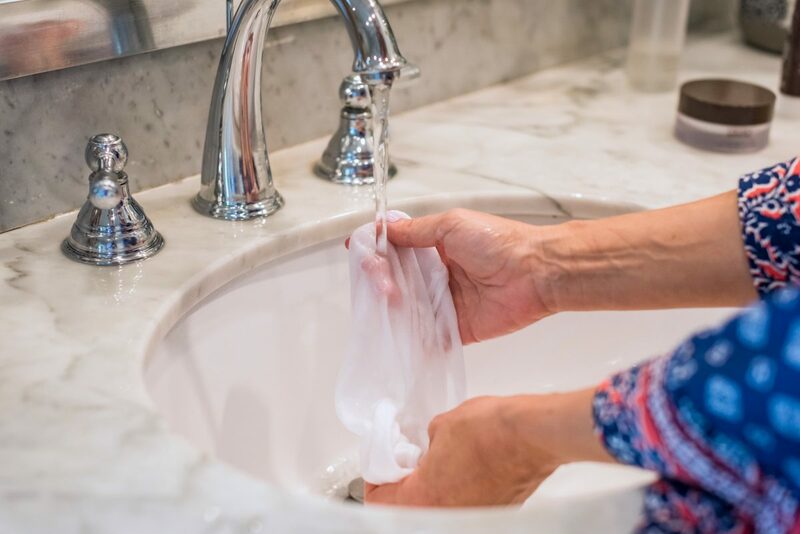 Try to keep the routine of cleansing each night and I think it makes a big difference. You look fabulous in your 40’s!!!! I’ve heard really good things about the Olay products too. I really enjoy my peppermint tea at night! It helps me wind down and makes me look forward to bedtime! I am not a tea drinker but I can see where drinking tea at bedtime might curve the craving for a late night snack. There are so many teas out there I would have no clue where to start. Which one is your go to? Thanks for sharing! That face oil is really one of my must-haves now. I’m surprised how much my skin loves it because I never thought it could take putting oil on it! I have a weird question. I am looking to purchase an upholstered headboard and love yours, although I think it might be too tall for my bedroom. Could you share how tall the ceilings in your bedroom are? thank you! I think they are 9 feet, but I will measure and provide all the details next week when I share the whole room!